Click here for the 2017 HockomockSports.com Baseball Awards. Below are the official 2017 Hockomock League Baseball All Stars, selected by the coaches in the league. 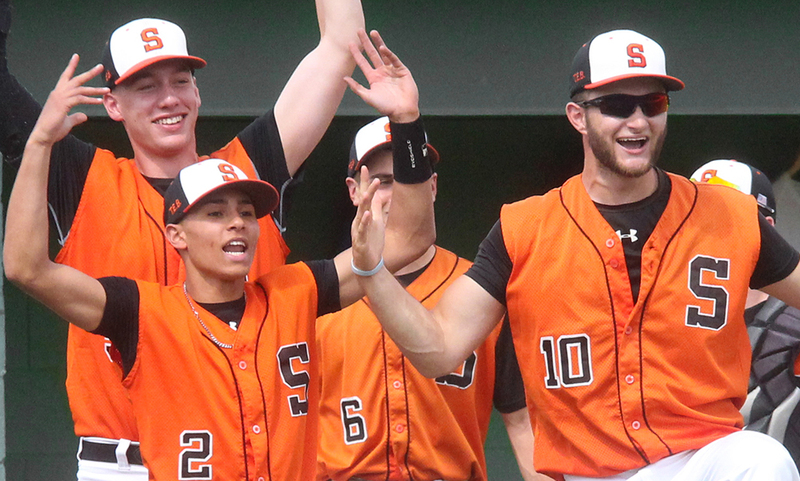 For a history of recent Hockomock League Baseball All Stars, check out our history section. Attleboro, 1 @ King Philip, 2 – Final – King Philip’s Ben Furfari was responsible for knocking in both of the Warriors’ runs, including the game-winner in the bottom of the seventh for a walk-off victory. Furfari put KP ahead in the first, knocking in Will Weir – double, stole third – on a sacrifice fly. Attleboro tied the game in the sixth, taking advantage of a pair of errors. Kyle Guenthner scored the game-winning run, reaching on an infield single, taking second on an error and coming home a base hit to right from Furfari. Chris Wing tossed 5.2 innings, allowing just one hit with seven strikeouts. Dan Antunes picked up the win in 1.1 innings of work in relief, striking out one without allowing a hit. Tyler McGovern had a strong outing for Big Blue, going 6.1 innings with three strikeouts and one earned run allowed. Canton, 1 @ North Attleboro, 2 – Final – North Attleboro junior Nick Sinacola threw a no-hitter and the Rocketeers scored the game-winning run in the bottom of the seventh to walk-off against Canton. In a complete game effort, Sinacola walked three and struck out 13 on 104 pitches. After six scoreless innings, Canton tied the game in the top of the seventh on a pair of walks and a pair of hit batters. Sinacola escaped the bases loaded jam without allowing any further damage. After taking a 1-0 lead in the fourth, the Rocketeers won the game in the bottom of the seventh. Tyler LaFreniere walked and pinch runner Jeff Gale stole second. Gale advanced to third on a base hit from pinch hitter Aidan Harding and then John Brennan brought the winning run home with a sacrifice fly. Foxboro, 8 @ Sharon, 6 – Final – Colin Thoener had a pair of hits and knocked in a pair of runs and the Warriors took advantage on a pair of two-run doubles in the third to hold off Sharon. Both Cam Feldman and Chad Bearce came through with a two-run double in the third to help starter Aaron Wentling earn the win. Steve McLaughlin came on in relief, getting the final out with the bases loaded to earn the save. Franklin, 1 @ Oliver Ames, 0 – Final – A pitcher’s duel broke out at Frothingham Park on Monday afternoon between Franklin’s Jake Noviello and Oliver Ames’ Sam Burr. The difference in the game came in the fourth inning when the Panthers scored the lone run of the game. Jake Lyons’ swinging bunt forced an errant throw to first, allowing the Franklin senior to get to second. Lyons moved to third on a sacrifice bunt from sophomore Alex Haba and came home on a sacrifice fly from Ryan Hodgkins. Josh Macchi had a pair of hits for Franklin. Noviello earned the win, allowing just three hits, walking one and striking out five in a complete game effort. Burr scattered six hits without issuing a walk, striking out three in a complete game performance. Taunton, 2 @ Mansfield, 13 – Final – Mansfield’s offense exploded for seven runs in the first inning and scored all 13 of its runs by the conclusion of the third inning. Max Boen had a team-high four hits, scored twice and knocked in one run, both Zack Peterson (run, RBI) and Cullin Anastasia (four RBI, two runs) had three hits for the Hornets and Aidan Cahill (three runs, RBI) registered a pair of hits. Nolan Dousa earned the win, striking out nine in six innings of work. Stoughton, 6 @ Milford, 8 – Final – Stoughton got off to a strong start with three runs in the top of the first but Milford had the answer, scoring seven runs in the bottom half off of seven hits. The Black Knights came back with three more runs to make it a one run game in the top of the second, but that would be the closest they’d get the rest of the way. Milford starter Nate Irwin settled down after the first two innings, allowing just three hits the rest of the way with five strikeouts. Ryan Goncalves had three hits and a run scored, Anthony Mobilia cleared the bases with a three-run double in the first inning and Aidan Wilde and Zack Tamagni each recorded a pair of hits for the Scarlet Hawks. Ruben Gonzalez, Jack Connelly and Nick Hardy each had two hits for Stoughton. King Philip, 18 @ Attleboro, 0 – Final (5 inn.) – King Philip’s Jenn Hutnyan didn’t allow a walk or a hit, throwing a perfect game as the Warriors ran away with a big win. Hutnyan helped her own cause, coming up with two hits and four RBI at the dish. Hailey McCasland had four hits, Sydney Phillips added three hits and Meg Gorman, Allie Kuchy, Jess Bonner, Brooke Taute and Brianna Lacy all chipped in with two hits apiece. North Attleboro, 15 @ Canton, 0 – Final (5 inn.) – Olivia Capobianco had a strong day at the plate and Bella Erti and Olivia DesRoches combined to allow just three hits as the Rocketeers rolled to a big win. Capobianco went 4-for-4 (two doubles) at the plate, recorded five RBI and scored three runs to pace Big Red’s offense. Liz Morehouse added a two-run home run and Abby Warren and Andrea Miceli each scored a pair of runs. Erti threw the first three innings with five strikeouts with five strikeouts while DesRoches allowed just two hits in the final two innings. Oliver Ames, 4 @ Franklin, 8 – Final – Franklin struck for six runs over the first three innings and tacked on two more in the fifth to double up on Oliver Ames. Ally Shea paced the offense, going 4-for-4 with four RBI while Anna Balkus chipped with two hits and two stolen bases. Emily Valentino earned the win for the Panthers, striking out three. For Oliver Ames, Katie Mills had a pair of doubles and two RBI, Sarah Tetrault had a pair of hits with a run scored and Caroline Mahoney went 2-for-4 with an RBI. Mansfield, 2 @ Taunton, 5 – Final – Courtney Fisher tossed a complete game to earn the win and Taunton’s offense came up with a pair of home runs to beat out Mansfield under the lights at Jack Tripp Field. Fisher scattered seven hits, striking out five with two walks to earn the win. Katie Van Zandt (2-for-3, double) had a solo home run and Jaylin Couto connected on a two-run blast. Kya Enos (3-for-3, RBI), Hailey Medeiros (RBI) and McKenzie McAloon each had a double for the Tigers. Liz Mackin opened the scoring for the Hornets with a first inning RBI single. In the sixth Marissa Staffer singled to cut the lead to one but the Hornets could not capitalize on a bases loaded situation. Megan Letendre had two hits for Mansfield on the night. Milford, 14 @ Stoughton, 0 – Final – Milford’s Kelley Reichert retired 11 batters on strikes, allowing just two hits in six innings of work to earn the win for the Scarlet Hawks. At the plate, Reichert added two hits while Jess Tomaso had a breakout game, going 5-for-5 with a triple, two runs scored, a stolen base and two runs scored. Maggie Farrell (3-for-5) had a double and four RBI and Shannon Cormier (3-for-4) scored a run for Milford (19 hits). Karly Estremera, Shannon Flaherty and Nikki Coppola each had a hit for the Black Knights. Mansfield, 8 @ Foxboro, 4 – Final – Mansfield built a 5-3 advantage halftime, didn’t allow Foxboro to score in the third and owned the fourth quarter to pick up the win. The Hornets won the final quarter 3-1 and forcing a handful of turnovers to secure the win. Sean Powers made 14 saves in net for Mansfield while Cullen Murphy paced the offense with a pair of goals and two assists. Danny DeGirolamo and Joe Cox each scored once and had an assist, Brad Grant netted a pair of goals and Mike Reed and Aidan Sacco each scored once. Tommy Donnelly and Mike Zampine each played well defensively for the Hornets. Franklin, 10 @ Oliver Ames, 2 – Final – Sam Arsenault scored a hat trick and Eric Civetti and Chase Tanner each netted a pair in Franklin’s win over Oliver Ames. “OA played very well defensively, we had to work for this win,” said FHS head coach Lou Verrochi. Jonathan O’Glishen and Nitin Chaudhury each chipped in with a goal, Jacob Alexander won 14 of 16 face offs and Connor O’Rourke recorded eight saves in the cage for the Panthers. Sharon, 2 @ North Attleboro, 14 – Final – North Attleboro had a dominate performance in a key league game, limiting Sharon to just one goal until the final minute of play. Zach McGowan paced the big offensive day for the Rocketeers, registering five points (one goal, four assists) while Tommy Lindstrom had four points (one goal, three assists), Colin Young scored a hat trick and Jack Dakin had two goals and one assist. Jason McNeany made a big difference for the Rocketeers, winning 14 of 16 face offs while Dan MacDonald turned aside eight shots in net. Owen Costello scored once and had two assists and Andy DeMattio (goal, assists) finished with two points. Nick Ward, Nick Moore, Nick Morse and Zac Doucette each scored one goal apiece while Hunter Sarro, Damien Curtis and Jack Connolly had one assist. Oliver Ames, 4 @ Franklin, 15 – Final – Annie Walsh registered five points while Erin Walsh, Caroline Lounsbury and Jordan Jette each recorded four points apiece to pace the Panthers past Oliver Ames. Annie Walsh scored four goals and had one assist to go along with Erin Walsh’s four goals, Lounsbury’s three goals and one assist and Jette’s four assists. FHS head coach Kristin Igoe Guarino said Grace McDermott (three draw controls, three ground balls) played well defensively. The Panthers’ offensive burst could have been higher if not for an incredible 27-save performance from OA goalie Ari Waldorf. King Philip, 5 @ Attleboro, 0 – Final – King Philip lost just two games total to sweep Attleboro and qualify for the state tournament. Cole Ginter (first singles) and Blake Ginter (second singles) each won 6-0, 6-0 while Martin Matous registered a 6-1, 6-0 win at third singles. The team of Sam Colella and Ryan Gemelli won 6-0, 6-0 at first doubles and Aidan Ignatius and Jake Webster took a 6-0, 6-1 decision at second doubles. North Attleboro, 2 @ Canton, 3 – Final – Canton’s Jake Wolicki dropped the first set at first singles but rallied back to win the next two, finishing it off with a tiebreaker to help the Bulldogs edge North. Wolicki won 5-7, 6-2, 7-6 (7-4) while Jeevith Chandrasekar won 6-3, 6-4 at second singles and Justin Diep took a 6-3, 6-3 decision at third singles as Canton swept singles play. North’s Daniel Zhang and Ben Pfeffer won 6-0, 6-1 at first doubles and Alex Pfeffer and Vikram Senthilakumaran took a 6-1, 6-0 win at second doubles. Sharon, 5 @ Foxboro, 0 – Final – Sharon earned a sweep against division foe Foxboro, winning all five matches in straight sets. Griffin Fein won 7-5, 6-2 at first singles, Fred Bondar earned a 6-2, 6-2 win at second singles and Andre Olivei won 6-1, 6-3 at third singles. Sharon had a pair of dominant performances in doubles play with Alex Romantz and Alberto Olivei recording a 6-0, 6-1 win at first doubles and Danujan Thirumavalavan and Ashwin Sreevatsa teamed up for a 6-1, 6-1 win at second doubles. Canton, 0 @ North Attleboro, 5 – Final – It was a clean sweep for the Rocketeers, taking all five matches to defend home court against Canton. Emily Chiasson won 6-0, 6-0 at first singles, Jordan Willis took a 6-1, 6-1 decision at second singles and Mae McLoughlin earned a 4-6, 6-2, 10-6 win at third singles. The team of Azka Siddiq and Katie Demontigny won 6-1, 6-1 at first doubles and Hana Hershey and Shurobhi and Nandi took a 6-2, 6-3 victory at second doubles. Foxboro, 1 @ Sharon, 4 – Final – Sharon earned a big win over division rival Foxboro, sweeping doubles play and earning two more wins in singles play. Nupur Shukla earned a 2-6, 6-3, 6-4 win at first singles and Lulu Yuan won 6-1, 6-0 at third singles for the Eagles. The team of Katie Merport and Emily Wen won 6-0, 6-2 at first doubles and Rithika Neti and Sophia Fein won 6-0, 6-2 at second doubles. Foxboro’s Lexi Nelson prevailed 3-6, 6-4, 7-6 at second singles. Franklin, 2 @ Oliver Ames, 3 – Final – After splitting the first four matches, it came down to second doubles between Franklin and Oliver Ames. OA’s team of Olivia Groebe and Kristin Bloumbas prevailed in a three set thrilling, 6-2, 5-7, 6-1 to help the Tigers secure the win. Maura Kiernan (third singles) won 6-4, 6-0 and the team of Tori Wyman and Tate Hadges (first doubles) won 6-0, 6-1 for Oliver Ames’ other two points. Franklin’s Hannah Sweeney won 6-0, 6-0 at first singles and Anja Deric earned a 6-2, 6-1 win at second singles. Taunton, 3 @ Mansfield, 2 – Final – Taunton’s Jillian Pagliuca rallied from dropping the first set to win the next two sets, giving the Tigers the winning point. The Tigers qualified for the state tournament with the win. Pagliuca won 2-6, 6-3, 6-4 to secure the final point. Taunton’s other wins came from doubles play as Ashleigh Eason and Emily Moor won 6-0, 6-2 at first doubles and Caroline Hebert and Jordan Martin won 6-0, 6-2 at second doubles. Mansfield’s Paulina Martin won 6-1, 6-0 at first singles and Sarah Doyle won 6-3, 6-3 at second singles for the Hornets. Taunton, 2 @ Braintree, 3 – Final – Taunton rallied from a 2-0 deficit to force a game five but came up just shy on the road at Braintree, falling 22-25, 18-25, 25-22, 25-18, 11-15. Lance Law had 19 kills, three aces and a block, Malik Charles added eight kills, four blocks and Lens Esquil chipped in with eight kills and five blocks. Click here to see the 2017 HockomockSports.com Boys Basketball Awards. 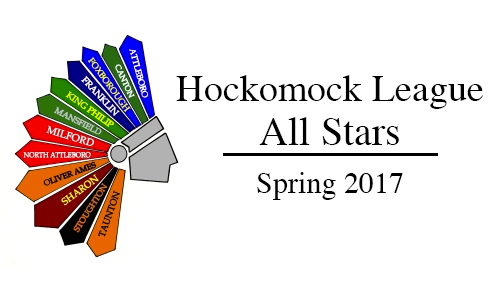 Below are the official 2017 Hockomock League Boys Basketball All Stars, selected by the coaches in the league. MARLBORO, Mass. – The venue was different, the opponent was different, but the situation was all too familiar for Milford. For the second straight year, the ninth seeded Scarlet Hawks found themselves on the road in a hostile environment in the First Round of the D2 Central Sectional and once again, down double digits. Last year’s second half comeback came up short in the final minutes but the 2017 Scarlet Hawks, with a bit more experience under their belts, erased a 12-point fourth quarter deficit and walked out of Marlboro High with a 78-73 win over the Panthers in overtime. “I think what really helped us tonight was last year,” said Milford head coach Paul Seaver. “I have a handful of guys who played on the road at Holliston in the same 8-seed, 9-seed matchup. We were down nine at halftime and we came back to take the lead but lost late. It was familiar tonight, playing from behind but tonight we were able to figure it out. The Scarlet Hawks made their move when they forced 6’8″ Marlboro star Chris Doherty to the bench with four fouls three minutes into the quarter. Junior Kayden Kelley (18 points, 14 rebounds, eight assists) converted a three point play on Doherty’s fourth foul, cutting the deficit to 61-53. With Doherty on the bench, Milford put together a 7-2 run over a two minute span. Kelley hit two free throws, Shane Cosquete hit a floater and Anthony Arcudi (25 points) drained a three from the corner to cut the deficit to three, 63-60, with 2:53 to play. Cosquete (13 points) another free throw, Alex Macek came away with a steal on the defensive end, and Zack Tamagni (16 points four assists) converted a three point play with just under two minutes to play to put Milford up 64-63. Marlboro’s Owen Cappadona (24 points) drained a three in response to put the hosts back up but Tamagni took a defensive rebound the length of the coast and laid it in to tie the game, 66-66, with 48.3 seconds to play. Milford got a stop on Marlboro’s next possession, but turned the ball over with 2.2 seconds left before getting a shot up. Marlboro had its last second shot from beyond half court hit the front iron to send the game to overtime. Doherty (17 points, 16 rebounds) started the overtime period and gave Marlboro a brief lead, 68-67 on free throw but Kelley responded with a shot over Doherty to put Milford up 68-67. The Hawks got a stop on the defensive end and Kelley hauled in the rebound. Doherty went for the steal but instead was whistled for his fifth foul with 3:05 to play. That gave Milford some momentum with Kelley hitting one free throw and then Cosquete driving to the basket to take a 71-67 lead. The Scarlet Hawks allowed Marlboro to get back into the game, turning to ball over on consecutive possessions leading to four points for the Panthers. But with Doherty on the bench, the Hawks continued to attack the basket with Kelley taking a feed from Macek to a bucket with just over a minute to play. Marlboro missed a three and Milford went right back to the paint, with Kelley converted a fade away off a pass from Tamagni – who saved the ball from going out of bounds. Marlboro cut the deficit to two, and then forced a turnover but their go-ahead three attempt rimmed out with 10 seconds to go. Arcudi hit two free throws to ice the game. Milford was forced to get the majority of its offense from outside the three point line early on in the game. The Hawks went 5/7 from three point range in the opening quarter but Marlboro shot 56% from the field, hitting 10 field goals for a 23-17 lead after one. Milford only hit three more three pointers the rest of the game. Marlboro led by as much as 13 in the second quarter but Milford battled back with Kelley connecting on a put back at the buzzer to keep the deficit in single digits – 37-29 – going into halftime. The Scarlet Hawks continued to claw back in the third quarter, getting within five points at the midway point when Tamagni sliced through the defense for a circus layup. But Doherty used a nice spin move in the post for a dunk that sparked a 9-0 run that put the Panthers up 14 with under two minutes to play in the third. Milford boys basketball (11-10) advances to the D2 Central Quarterfinal to take on top-seeded Nashoba (17-3). Of Nashoba’s three losses, two were against Marlboro. The Hawks will travel to Nashoba on Thursday at 7:30. North Attleboro, 56 @ Attleboro, 54 – Final – Click here for a recap of this game. Foxboro, 69 vs. Randolph, 58 – Final – Foxboro had a strong third quarter, turning a five-point lead into a double-digit advantage (57-45) going into the final quarter. It was a balanced scoring attack for the Warriors with four players scoring in double-figures. Senior Andrew Block led the way with 14 points, freshman Brandon Borde added 12 points and Joe Morrison and Joe Bartucca each scored 10 points. Mark Clagg added nine points and Jamaine Few finished with eight points. Franklin, 70 vs. Cardinal Spellman, 66 – Final – Franklin was impressive in the first three quarters, building an 18 point lead before Spellman closed the gap in the final quarter. Franklin senior Josh Macchi registered a career-high 22 points while junior Paul Mahon added 15 points and sophomore Jalen Samuels finished with 14 points. Mansfield, 66 vs. Brockton, 42 – Final – Click here for a recap of this game. Milford, 73 vs. Medway, 46 – Final – With its back against the wall, Milford put on a dominant performance to qualify for the state tournament for the second straight year. Scarlet Hawks seniors combined for 52 points to lead the way. Anthony Arcudi had a team-high 18 points while Nate Davila had 14 points, Zack Tamagni had 13 points and Alex Macek chipped in with seven points. Junior Kayden Kelley had 11 points and 17 rebounds in the win. Oliver Ames, 66 @ Walpole, 53 – Final – Oliver Ames finished the regular season on a high note, taking the consolation game in the Rebel Classic at Walpole. Junior Jack Spillane poured in a team-high 25 points to pace the Tigers while Carter Evin added 15 points and Dylan Mahoney chipped in with 12 points. OA now awaits seeding for the D2 South tournament. Sharon, 62 vs. Xaverian, 58 – Final – Sharon won the 2017 Walpole Hoop Classic win a win over Xaverian, ending the 2017 campaign on a four-game win streak. Junior Malik Lorquet was named tournament MVP, scoring 12 points and adding 14 rebounds. Junior Jimmy Fitzhenry was named to the all tournament team after scoring 14 points. Senior Ricardo Ripley finished with a team-high 17 points, eight assists and seven rebounds. Stoughton, 64 vs. Tantasqua, 59 – Final – Stoughton junior Cam Andrews dropped a team-high 20 points and senior Cam Gomes chipped in with 13 points as the Black Knights advanced to the finals of the Warrior Classic to play Foxboro. North Attleboro, 51 @ Attleboro, 47 – Final – The Rocketeers avenged an earlier loss to the Bombardiers. Emily Schromm was the top scorer for North with 13 points and fellow senior Samantha Taggart scored 12. Attleboro was led by Sarah Deyo’s 22 points. Foxboro, 54 vs. Whitman-Hanson, 39 – Final – Recently named league MVP Ashley Sampson led the way for the Warriors with 27 points and senior Kristen Bortolotti added 12 in the win. Foxboro will face Lincoln-Sudbury in the final of the Warrior Classic on Tuesday at 6:30 p.m.
Mansfield, 54 vs. Marlboro, 38 – Final – Click here for a recap of this game. Stoughton, 8 @ Foxboro, 2 – Final – Junior forward Brendan Campbell scored a career-best four goals to lead the Black Knights. Sophomore Sean Doherty netted a hat trick and classmate Luke Bainton found the back of the net once. Taunton, 3 @ Mansfield, 5 – Final – Mansfield scored three goals in the third period to earn two points and qualify for the state tournament. The teams were level 1-1 after the first period, and then 2-2 during the second period. Tim Arnold gave the Hornets the lead in the third period on assists from Chad Piotti and Cullin Anastasia. Freshman Chris Jenkins gave Mansfield a 4-2 advantage on the power play, taking a feed from Anastasia. Taunton cut the deficit to one but Matt Farragher scored a shot handed goal off an assist from junior Tyler Oakley. Joe Olsen scored in the first period on assists from Farragher and Oakley while Farragher scored in the second on an assist from Olsen. NORTH ATTLEBORO, Mass. 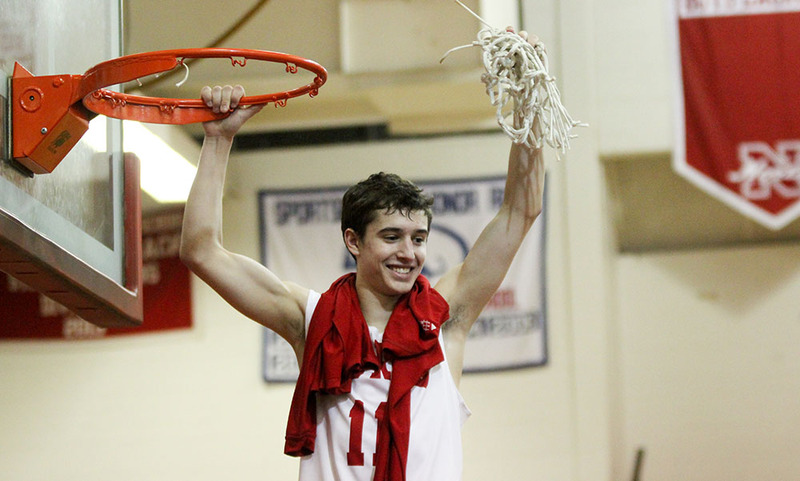 — It’s been quite a 10-day stretch for North Attleboro, qualifying for the postseason for the first time since 2011 last week and winning their first Hockomock championship since 2001 on Friday night. But the Rocketeers had no problem getting motivated for Sunday night’s contest with the visiting Milford Scarlet Hawks. All they had to do was look back three weeks when the Hawks went coast-to-coast to beat the Rocketeers on a buzzer beater at the Dunkin Donuts Center. Or two seasons ago, when a pair of free throws with no time left turned a one-point advantage into a one-point loss. In fact, North Attleboro’s senior class was winless against the Hawks heading into the final Hockomock League game of the season. 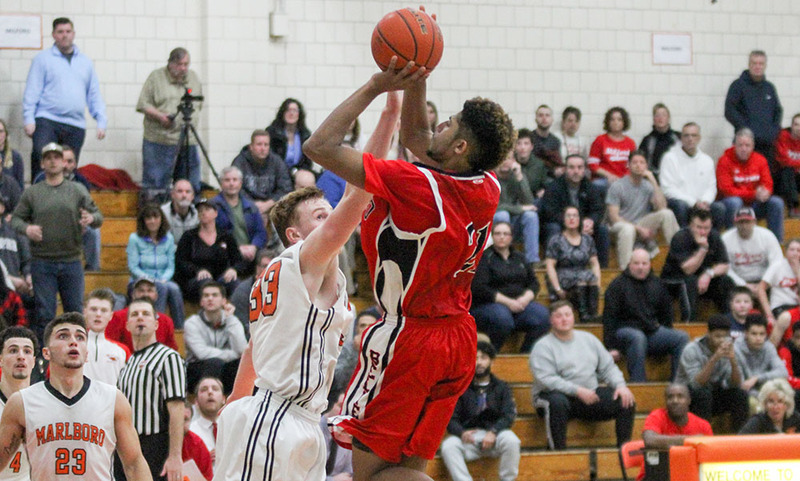 Hosting Milford for the first time in four years, the Rocketeers closed out the fourth quarter in true championship fashion, outscoring the Scarlet Hawks 20-1 over the final six minutes of play to turn a close game into a 66-45 win. “It’s a satisfying win for the kids, especially for the seniors,” said North Attleboro head coach Sean Mulkerrins, who also picked up his first win over Milford. “For the past four years, Milford has been our boogeyman, we just couldn’t beat them. Hopefully this is just one in a string of games that we’re in here that could potentially get us a home game in the playoffs. North Attleboro’s strategy to feed big man Jonny Friberg paid off in two ways – the 6’6 senior poured in a career-high 28 points while hauling in 11 rebounds and the pounding inside resulted in some fouls for the Hawks. Milford was whistled for eight fouls in the third quarter — four of them on Hawks leading rebounder Kayden Kelley (five points, six rebounds). The Rocketeers started their big run taking advantage of Kelley’s absence with Chad Peterson (eight points, six rebounds, five assists) finishing a put back, Reynolds (nine points, two rebounds) hitting a free throw and then Peterson draining a three off of an offensive rebound. Brent Doherty (14 points, four rebounds, four assists) found Friberg in the post for two to extend North Attleboro’s lead to 55-44 with four minutes to play. After a pair of stops from the Rocketeers’ defense, Reynolds drained a three off a pass from Peterson to make it 57-44 with 2:31 to play. Doherty added a layup and Reynolds added two more free throws to push the run to 15-0 over a five minute span. It marked the second straight game that North Attleboro kept its opponent for five minutes in the final quarter. Milford shot 0/6 and had five turnovers in the stretch. North Attleboro had a near flawless start to the game, finding Friberg early and often. The senior scored 11 of the team’s first 14 points while Doherty added five and Peterson had a trifecta. North shot 8/11 from the field while forcing four turnovers. But Milford responded with an even better second quarter to take the lead into halftime. After North scored the opening bucket of the quarter, the Hawks went on a wild 18-0 run to seize a five point advantage. Zack Tamagni (14 points, four assists) bookended the run with a pair of layups while both Nate Davila (nine points) and Shane Cosquete (nine points, five rebounds) hit a pair of three pointers in the stretch. The Rocketeers closed the deficit some in the final two minutes of the half, with Doherty finding space for a layup and Friberg grabbing an offensive rebound and scoring right before the buzzer. Milford led 28-25 at half. Big Red carried that momentum into the third quarter and used a 12-0 run to take the lead back. Reynolds started the run with a three, Friberg added two free throws and a bucket in the paint and Doherty hit a three and converted a put back in the stretch. North Attleboro finished with 19 assists on 23 made field goals and won the rebounding battle 30-27. North Attleboro boys basketball (13-7 overall, 10-6 Hockomock) is back in action on Monday when they travel to take on rival Attleboro in a non-league contest at 6:00. Milford (9-10, 7-9) is also back in action on Monday when it hosts Medway. The Scarlet Hawks need a win to get into the state tournament. Attleboro, 61 @ King Philip, 58 – Final – Attleboro sophomore completed a traditional three point play with 14 seconds left in the game to give the Bombardiers a 59-58 lead and Jake Dunkley and Andrew Milliken each hit a free throw in the waning moments to earn the win. The Bombardiers rallied from a 20-point deficit in the first half to get the win. Dunkley finished with 14 points, Milliken had 10 and Victor chipped in with 10 points. Canton, 34 @ North Attleboro, 59 – Final – North Attleboro scored 17 points in the first quarter while holding the Bulldogs to just six and never looked back, snapping a three-game losing streak. “I’m proud of how are kids played tonight,” relayed North coach Sean Mulkerrins. “We weren’t happy with how we played Wednesday so this was important. We challenged our kids to play with more passion tonight. If we continue to play hard on defense and smart on offense we know the results will take care of themselves.” Senior Brent Doherty scored a game-high 17 points while hauling in seven rebounds and classmate Jonny Friberg dropped 16 points and had 14 rebounds. Thomas Reynolds chipped in with 11 points for Big Red. Canton’s Tony Harris and Paul Corcoran each scored seven points. Foxboro, 67 @ Sharon, 54 – Final – Foxboro erased a first quarter double digit deficit to get within a point at halftime (33-32) and then used a 10-0 to begin the second half. The Warriors went on to win the second half 35-21. Sharon built a 19-5 lead in the first quarter, taking a 21-11 lead after eight minutes. But Foxboro clawed back to get within one by halftime. Junior Joe Morrison and senior Andrew Block each scored 14 points for the Warriors while Mark Clagg added 12 points, Jamaine Few had 11 points and freshman Brandon Borde chipped in with nine points. Sharon junior Malik Lorquet had a game-high 16 points while senior Ricardo Ripley finished with 14 points. Franklin, 64 @ Oliver Ames, 52 – Final – Click here for a recap from this game. Mansfield, 80 @ Taunton, 72 – Final – Mansfield senior Sam Goldberg scored 18 of his career-high 30 points in the first half and the Hornets held off a late surge from the Tigers to get the win. The Hornets built an early 15 point lead by Taunton battled to get within four (42-38) at halftime. The Tigers used a 6-0 run to start the second half to take the lead but Mansfield took a 59-58 lead into the fourth quarter. Taunton’s Tommy MacLean (14 points) drained a three with just over four minutes to go to bring Taunton with three at 68-65, but Mansfield responded with seven points to extend the lead to 10 with just over two minutes to play. Christian Weber also scored a career-high for the Hornets, netting 23 points including 10 in the final quarter. Taunton freshman Dante Law and sophomore Lou Vendrell each had 15 points for the Tigers while junior Malik Charles had 12 points. Stoughton, 47 @ Milford, 67 – Final – Milford got off to a strong start and never looked back. Senior Zack Tamagni netted a career-high, dropping 26 points in the win, Shane Cosquete added 11 points and Kayden Kelley notched another double-double with 10 points and 13 rebounds. Stoughton senior Matt Valle scored a career-high 17 points for the Black Knights. Canton, 37 @ North Attleboro, 56 – Final – Caroline Collard scored a team-high 11 points for North, while Julia Feid chipped in with 10. Hannah Jerrier was the top scorer for the Bulldogs with a game-high 19. Foxboro, 65 @ Sharon, 28 – Final _ Ashley Sampson continued her strong week for the Warriors with a game-high 20 points. Franklin, 59 @ Oliver Ames, 48 – Final – Click here for a recap from this game. Mansfield, 62 @ Taunton, 32 – Final – Jen Peel was the top scorer for the Hornets with 16 points and also dished out seven assists. Meg Hill also had a strong game for Mansfield with 12 points and nine rebounds. Alexa White led the Tigers with eight points and eighth grader Sonya Fernandez added seven. Stoughton, 24 @ Milford, 55 – Final – Kate Irwin paced the Hawks to a big division win with 23 points. Senior Nicole Dahlgren added 16 for Milford, which moves back to .500 in the league and within one win of tournament qualification. Hockomock League Championships (@ Milford) – Click here for full results and photos.